AAAAAAAAAAAAAAAAAAAAAAAAAAAAAAAAAAAAAAAAAAAAAH!!!! Ayoko na! Ayoko na! May tao dun sa journ room ng Filipino!! Ahhhhhhhh!!!! Gusto ko nang umuwi kaya tumingin muna ako sa labas. Tapos pag-labas ko, mat tao sa journ room sa kabila. Basta, naka-silip siya!! Pagka-labas namin, may naka-tingin mula sa bintana ng journ room. Akala ko talaga may tao kasi hinawi niya pa ung kurtina para makita tayo. Ang nasa isip ko tuloy nagtra-training din ung mga ‘Ilawers’ (What the FIlipino journalists call themselves. Ilaw – The title of the Filipino Newspaper), kaya nga diba Cee wala akong takot na lumabas pa lalo. Kaso, pagtingin ko sa pintuan, naka-padlock! Kaya sumigaw na kami ni Cee papasok. At first, I thought they’re just joking. Actually, we all thought the two of them was joking. When some of us peeked out from the window, we saw writings on the whiteboard of the other room. But that is just the list of the parts of the newspaper. I decided to call the others for us to go outside and ‘investigate’. The room is locked.. it is locked real good. I turned my laptop off because we decided to go home. But minutes before that happens we tried to ‘investigate’ again. And I concluded to them that what they saw is a real ghost!! It is impossible for them to see someone in the room because it is locked. DUH! 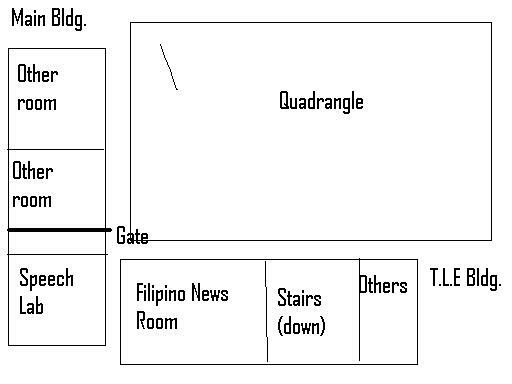 And it’s also not or reflections because the window glass in the Filipino news room can’t reflect anything. Oh my, we really have to go home!! The classes are suspended because of the heavy rain. The competition is postponed until further notice. The training we had last Saturday for nothing, shees! Oh well, at least we had a blast. The classes are suspended and MM is now on code red. Oh Jesus Christ, help us.